Major General S.S. Mahal, Rear Admiral D.S. Gujral and Air Vice Marshal RGK Kapoor during a press conference in New Delhi on Feb 28, 2019. New Delhi: The Indian Air Force (IAF), Army and Navy said on Thursday that they were on high alert and that Pakistani jets tried to target Indian military installations in Jammu and Kashmir a day earlier but were pushed back. Air Vice Marshal R.G.K. 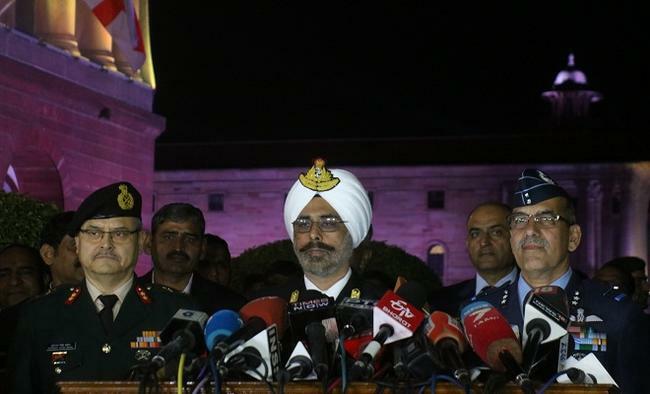 Kapoor told the media at a tri-service press conference that the Pakistan Air Force (PAF) breached the Indian airspace west of Rajouri in Jammu and Kashmir on Wednesday.The Pakistani attempt was to target Indian military installations but the Pakistani jets were forced to retreat by Indian MiG, Sukhoi and Mirage aircraft. Air Vice Marshal Kapoor said while Pakistan claimed that its jets fired bombs in open areas, "the fact is that Pakistan targeted military installations but we thwarted their plans. The bombs were unable to cause any significant damage due to swift IAF action". "IAF remains ever vigilant and ready to take on any eventuality," he said. He refuted Pakistan's claims that it had not used F-16s on Wednesday and said that one F-16 was shot down by a MiG-21 Bison.Major General S.S. Mahal said that PAF's targets on Wednesday included a Brigade Headquarters, a Battalion Headquarters and logistics installations in Jammu and Kashmir. But their designs were foiled because of the high level of preparedness by the Indian armed forces, he said.He said Indian weapons systems had been put on high alert and mechanized forces had been placed on standby. "We are fully prepared to respond to any provocation." Rear Admiral D.S. Gujral said: "The Indian Navy is deployed in a high state of readiness and remains poised in three dimensions -- surface, under the sea and in air to deter, prevent and defeat any misadventure by Pakistan in the maritime domain. "I can assure you of a resolute, swift and strong response by the Navy whenever needed."